What are the attributes of your product or service? What is it made of? What are the specifications and special functions of the product? What do you do? For example, let’s say you run an internet marketing/web development company. The main features of your services are that you make websites, optimize them for search engines, integrate social media, and build in systems to capture contact information. How is your product or service better than your competitors? What makes it the best product or service on the market? Continuing with the same example, you could inform potential customers that most web development companies stop at simply building the website and explain that just having a website is pointless. Your service is better because it has three other vital components. What is the core value that your product or service provides to your customers? What problem does it solve? How will your customer’s life improve as a result of paying you? Back to your company, the benefit to your internet marketing service is that your customers will capture more sales leads and attract more customers as a result of your superior service. The small business owner doesn’t want a website. They want to make more money. A website just happens to be a great way to do that. If you can show that your internet marketing service will result in more money for your customer than you charge them, it’s a no-brainer. They’ll hire you every single time. All day, every day. The FAB technique should be plastered all over your fliers, posters, website, packaging, and strategically placed throughout your sales pitch. Any time you’re trying to convince someone to do something, you need to use it because people only respond to benefits (“What’s in it for me?”). 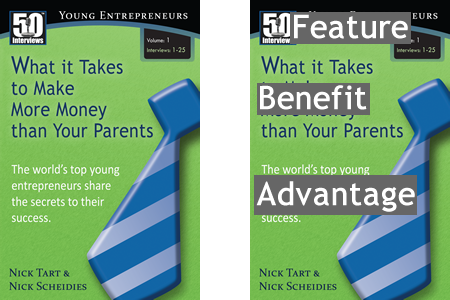 Advantage: The world’s top young entrepreneurs share the secrets to their success. 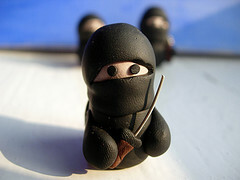 If a ninja wants to make a website that will attract more clients (rather than just being a really cool website), then that ninja needs to utilize the advantages and benefits of their services.